What Happened to Franklin Blazer? 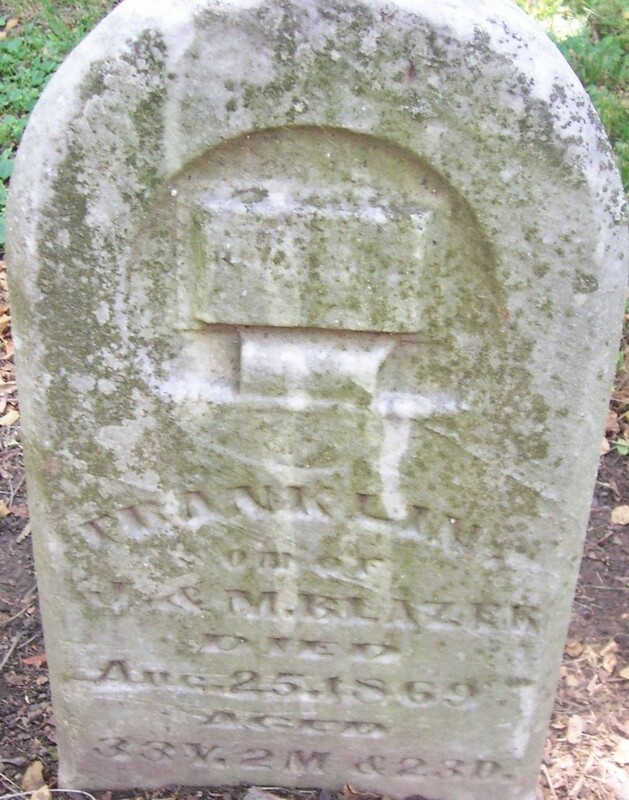 A year ago I wrote about my great-great-grandfather Franklin Blazer in Week 1 of the 2014 Edition of 52 Ancestors in 52 Weeks. Up until today, the cause of his death was a mystery. He died on August 25, 1869 so I thought he may have died due to injuries sustained in the Civil War or perhaps he was killed in a farming accident or died of some disease. I was so very wrong. What could only be termed a tragedy is what befell poor Franklin. He and Malissa Goul had been married at least ten years and possibly upward to 14 years. Their children, two boys and three girls, ranged in age from 2 years to 9 years old. In fact the oldest son, John F., was a month from turning ten – not yet a teenager and definitely not ready to be the “man of the house” at such a young age. Malissa’s son from a previous relationship, James Oakland Goul, was about fourteen. Thanks to a post on Genea-Musings by fellow geneablogger Randy Seaver, I learned about a new free search tool call Genealogy Gophers. It searches for names in texts of Google books. I plugged in the name of Franklin Blazer and the first result that popped up listed not only Franklin Blazer but Malissa Goul. I knew I had found the correct person. I clicked on the snippet and lo and behold it was an entire book that included tons of information on those with the surname of Blazer and everything within the soundex of B-426 written by John Allison Blazer from Hendersonville, Tennessee. There isn’t a date on it except for the filmed date of 2000. I can’t even imagine what the rest of the family went through after that. Did Malissa and any of the children witness this? Did they try to revive their husband and father after he had fallen dead? Was a physician summoned quickly? The weather must have been pretty fierce. It was still tornado season so I wondered if they were also terrified of what else Mother Nature had in store for them. Franklin had just turned 33 years old. He would never be able to enjoy a life of watching his children grow up and get married. His wife, my second great-grandmother – would never celebrate another wedding anniversary. She remained a widow the rest of her life. Martha, Katie and Rachel all married without their father giving them away. John and Wesley grew into men quickly in order to take on what their father had once done. Twenty-six years after his father’s tragic death, John died of self-inflicted gunshot wound. As I think about my great-grandmother, Katie, who lost her father when she was almost five years old, I wonder if she had been a “daddy’s girl” and missed him terribly the rest of her life. Or was she so young that she barely remembered him? Did losing Franklin at such a young age change Malissa – her outlook on life, personality, or how she handled sorrow from then on? 33 Y. 2 M & 23 D.